After searching for over fifty years for a photograph of the nose art on B-17G, serial number 43-38563 without success I was surprised to receive a phone call from Bud Miller who asked, "Are you the Samuel W. Smith who was a pilot attached to the 360th squadron of the 303rd Bomb Group, "Hells Angels"? I replied that I was that person. He then told me that his best friend was Merrill Stiver who was also a pilot attached to the 360th. He and Merrill had determined that we had flown on four missions together. 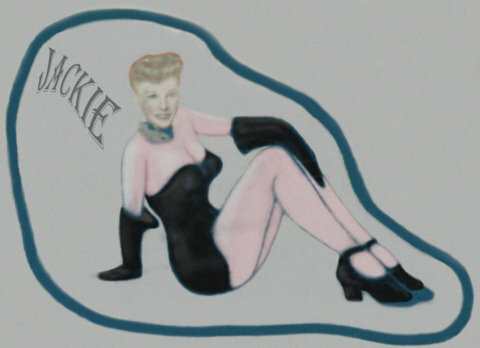 Merrill had the nose art painted on "Jackie". I asked how to contact Merrill and was informed that he took his last flight the week of January 19, 2009. I asked if there was a photo of the nose art and learned that Bud had a photograph given to him by Merrill. He said he would send a copy as well as the story behind the photo. Merrill Stiver's B-17G flying fortress was severely damaged over Euskirchen, Germany on December 27, 1944. Due to excessive damage to this plane it was retired to become a "Hanger Queen" to be used for spare parts. After flying several other planes Stiver was assigned a new B-17G, serial number 43-38563 that had been flown a few hours as a command aircraft and had no name or nose art. Stiver hired one of the talented mechanics to copy a photograph of his wife, Jacqueline, and paint her on the nose of this plane; and the name "Jackie" was born. Many of the older planes had pinups, nudes and nose art that was unacceptable to Mrs. Roosevelt, so "Jackie's picture was modestly clad in a swimsuit. "Jackie" was assigned to Master Sergeant Carl P. Tarr, from North Anson, Maine who with his crew provided superior repair and maintenance. We were fortunate to have his crew in charge of our plane, and never could have completed our missions without them. The first mission we flew in "Jackie" he asked my age and I replied that I was 20. He said, "Good Lord they get younger every day". He watched us very carefully and after a few missions invited us into his tent for coffee. He especially liked the way we handled the engines. He confessed that he was proud that each engine had over 200 combat hours since the last overhaul. "I said lets shoot for over 300" which put a grin on his face. We had flown "Jackie" on six or seven missions when one of the new replacement crews flew the plane. After the mission was over M/S Tarr came to me and said, "Lt. you go tell Capt. Hatch that no other pilot can fly our plane." From that day my crew flew "Jackie" on our remaining missions. By the end of the War in Europe we had logged over 300 combat hours on each engine. After Stiver completed his tour, "Jackie" was assigned to several other pilots who continued to fly her in combat, Logan Hatch and Samuel W. Smith to name a few. By the end of the War in Europe, B-17G, serial number 43-38563 had been flown on 83 combat missions. Jackie was returned to the States after WWII ended and was scrapped at Kingman, Arizona.